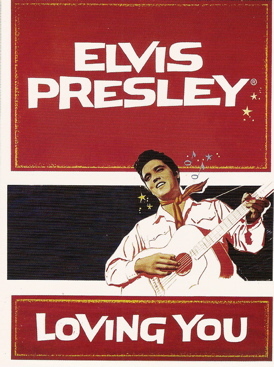 Loving You was one of the 10 Elvis movies made before I became a Presley fan in 1962. It wasn't until several years later that I finally got a chance to see the movie on TV. While viewing the film recently for this review, I was struck by the differences between it and Love Me Tender, which had been released a mere seven months before. 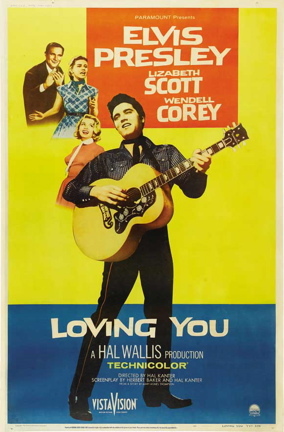 Of course, Loving You was filmed in color and so is much more visually striking than Elvis's first film. But it's how Elvis is presented that is the fundamental difference between the two films. 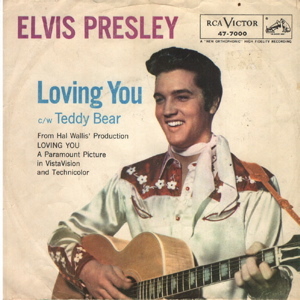 It took 20 minutes for Elvis to make his first appearance in Love Me Tender; he shows up driving a hot rod only four minutes into Loving You. And he's singing just six minutes after the opening credits, while it took 50 minutes for him to pick up a guitar in his first movie. And while Elvis's four songs in Love Me Tender were bunched together in the middle of the movie, he sings 10 times evenly spaced throughout Loving You. After "Got a Lot of Livin’ to Do" at the six-minute mark, he adds "Party" 11 minutes later, and a medley of songs less than two minutes after that. Then come "Lonesome Cowboy" and "Hot Dog" before the film is 30 minutes old. 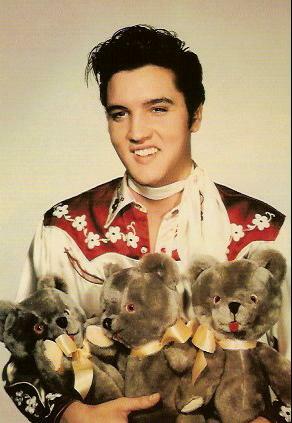 The interval to "Mean Woman Blues" is about 10 minutes, with "Teddy Bear" just five minutes after that. There are still other numbers, but you get the picture. 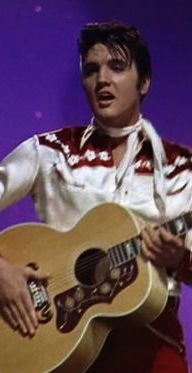 Hal Wallis had decided the way to feature Elvis on film was to have him sing early and often. When high box office receipts validated Wallis's strategy, it set the formula for most of Presley’s later movies. 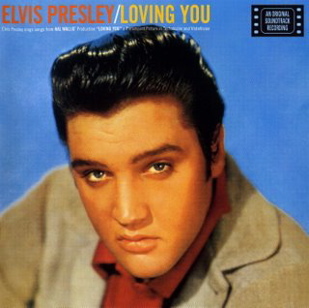 Elvis's physical appearance in Loving You had also changed. He seems to have added a few well-placed pounds on the lean frame seen in Love Me Tender. The most notable change, however, is in his hair, now greasy and black instead of wavy and brown like in the earlier film. The black hair better suits his character’s sullen, bad boy look, but the "greasy, kid’s stuff" seems a bit overdone at times. At one point in the movie, his hair is so stiff that it projects straight out over his face like the bill of a cap. Early in Loving You, Tex Warner (Wendell Corey) is shown reading an issue of Variety. That show business weekly gave Loving You extensive coverage in 1957, including pre-production, bookings, and box office results. Variety previewed Loving You at the Capital Theatre in New York on June 20, 1957, and its review appeared in its July 3, 1957, issue, six days before the film's official release date. The review opened with the following two-sentence summary: "Elvis Presley returns in a picture tailor-made to his talents. It’s a rock 'n' roller with a good story-line that shapes as a juve trade natural." Hift praises producer Hal Wallis for starring Elvis in a simple story that can be believed. He says the story has Elvis doing what he does best, "shout out his rhythms, bang away at his guitar and perform the strange, knee-bending, hip-swinging contortions that are his trademark and that, for unfathomable reasons, induce squealing noises from his young fans." Hift was obviously trying here to do what many other writers had to do in 1956 and 1957: review a phenomenon in the entertainment business that he simply didn't understand. 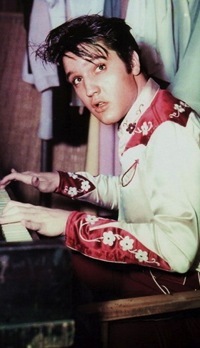 The reviewer did admit, however, that Presley's acting had improved since his first movie. "It’s not a demanding part," he explained, "and, being surrounded by a capable crew of performers, he comes across as a simple but pleasant sort." Herbert Baker and Hal Kantor's script is judged simply as "okay," with its "folksy humor," "sentimental strains," and "corny aspects." Kantor's direction "consciously pitches the proceedings to the teenage mentality." Co-stars Lizabeth Scott and Wendell Corey are credited with "delineating definite characters and doing well in the laughs department." Hift singles out newcomer Dolores Hart for special praise. "The young actress conveys a very pleasing personality and handles her chores with charm. She ought to be seen again." (And, of course, she was, in King Creole the following year.) The review downplays the film’s seriousness but predicts financial success. "It’s all highly exploitable stuff," Hift writes. "Film shapes as a bangup attraction for the hinterlands and should be a crowd-pleaser in the keys where Presley is still a draw with the youngsters … There'll always be those who'll find the whole Presley phenomenon either laughable or even disgusting, yet these probably won't be those who'll go to see the film anyhow. It's surely not a critics' picture, but, from the looks of it, it's boxoffice. And who's to quarrel with that in 1957?" Hift closes his lengthy review with praise for Elvis's manager. "Col. Tom Parker gets credit as Technical Adviser, and take that literally and seriously. He's an expert property developer." 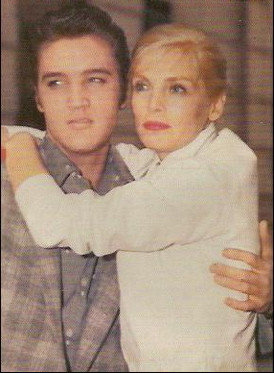 Speaking of the Colonel, I wonder if he noticed any similarity between Lizabeth Scott's role in Loving You and his own role as Elvis's manager. I did. As an ambitious publicity gal, Scott's character generates a series of phony publicity stunts to promote Deke Rivers, Elvis's character. She even lies to him about her activities on his behalf, and gets him to sign a personal contract giving her 50 per cent (sound familiar?) of his future earnings. She is, as the Variety review called Parker, "an expert property developer." Finally, according to Scotty Moore’s book, Elvis deserves the credit for getting all of his side-men in this film, after they all were left out of Love Me Tender. Scotty, Bill Black, and DJ Fontana are seen frequently as members of the hillbilly band backing Deke Rivers throughout Loving You. Black even has a couple of lines, while Fontana has his own brief scene taking a poster off a wall. The Jordanaires are on stage with Elvis for the nation-wide television show at the movie's conclusion. 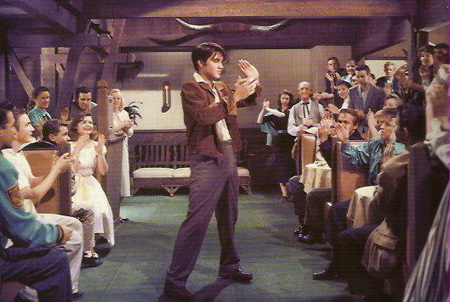 And, of course, Elvis's parents are shown sitting in the audience during the movie's final production number. "Elvis's acting had clearly improved over his first film, and any doubts industry executives might have had about his ability to carry a film faded away."